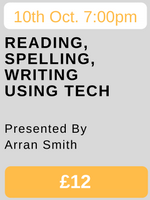 Our Next webinar takes place on 10th Oct. at 7pm sees the return of Arran Smith SEND Group CEO and we are delighted that she’s going to speak about Webinar- Reading, Spelling, Writing using Tech! This webinar will be looking at technology which is available to the education community to help support and teach those students with specific learning difficulties, particularly in the areas of reading, writing and spelling. The webinar will look at the problems that students face with reading, spelling and writing. With looking at using different techniques along with different technology strategies to support learners with specific learning difficulties such as dyslexia. The webinar will go into different products and services that can be used to support the way that these young people learn differently, with reading, writing and spelling. Looking both at the productive and supportive methods of engaging with young people. Arran Smith will be facilitating this webinar has worked in the field of dyslexia for over 15 years. As well as being severely dyslexic Arran is the current chairman of the Leicestershire dyslexia Association has previously worked for the British dyslexia Association. 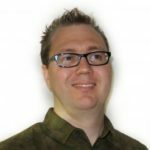 Arran uses assistive technology everyday supportive needs along with working with other companies within the AT marketplace.